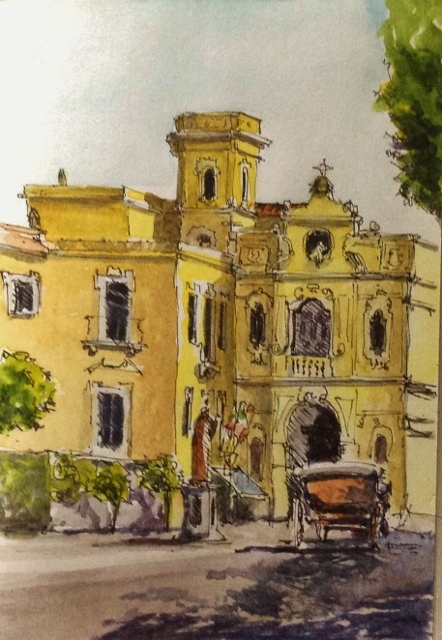 The next day, Sunday, we had a morning tango lesson but I got up early and walked into the center of Sorrento to search for a quick drawing in my small sketch book. I noticed the morning sunlight on the lemon yellow church and felt this represented the town and wanted to produced a quick drawing where I could add the washes later. Reproducing the hues and tones of the lemon yellow was going to be tricky. I found a corner of the square, out of the way, perched on my stool in a good place to see all. Until… as soon as I saw it in the distance I knew it was destined for me. A horse drawn carriage was gently clopping towards me. For a second I thought it was going to stop short and I would be saved, but no, the driver reversed the carriage right in front of me obliterating every part of the view. To his defense he did come over to me, take look at my sketch, approved it and then asked me if I would like him to move the carriage. I said no, the damage was already done. The morning lesson, involved various calesitas (caraselles). I find these moves very emotive and need to be used at really special parts of the music. So this was a valuable lesson. We were travelling to a Milonga in Naples in the evening so I had an afternoon to spend drawing. Lunch was first at a local restaurant with a lovely group of people. We sat outside in a typical Sorrento alleyway (a future painting) making the most of the tourist menu. I didn’t drink wine as I wanted a clear head for drawing later but the lemonadesoda was perfect. With some difficulty I left the group to walk to the port.I settled down on some wide steps using my new travelling stool and started drawing. The scene was ambitious, taking the whole cliff line from Sorrento going east, including the Marina. Naturally things didn’t go to plan. When the ferry arrived hoards disembarked and they used the steps as a meeting point, obliterating my view several times. I’m sort of getting used to this by now and with such a huge subject in front of me there was always something else to draw. This part of the port is given over to feral cats, causing the ferry passengers to ooh and arrh over the kittens. To me it quickly became apparent that I had selected to sit next to a cats toilet. I soldiered on for my art. Vans, boats and ferries parked in front of my view in regular fashion but eventually the smell and distractions made me move. I stood, perched, sat on bollards and prowled the area looking for a comfortable place to continue for the rest of the afternoon. I plan to colour in the drawing but need some time to make sure I don’t mess it up with poor washes and too intense colours. The evening Milonga in Naples was magnificent. The Naples traffic delayed us but we received a big welcome from the host and settled into a steamy (humid) night of tango. Santiago & Sandra were brilliant when they danced for the gathering and received a wonderful applause. For me it was a very special night and I thank all the Neapolitan ladies for their beautiful dances.